It is with great pleasure that we invite you to live our planning and estimation experience for your patio construction project with the help of our new 3D technology. This innovation makes for a very rich visual experience, enabling you to make layouts and color schemes while combining your choices of materials, textures and original colors. All of it with real-time estimation for your project. Free, no installation necessary, no plugins, it works on all platforms, it’s the start of a new era for the Virtual Constructor application now unveiling it’s 3D visualization technology that our 20 000 unique visitors per month will appreciate. Just like our partnered entrepreneurs, hardware stores and materials manufacturers that are more and more to adhere to our different use and visibility programs. And that’s not all because soon we will be launching sheds project in 3D followed by the garage projects, building extensions, cabins and tiny houses that you will have pleasure to share with your friends. Subscribe to our newsletter to stay informed. 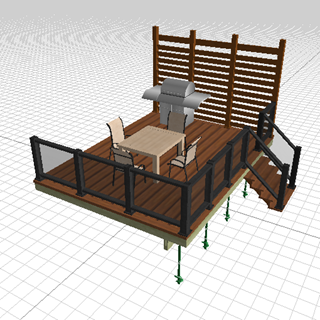 Go ahead, try our new 3D patio application.